While the term "legend" finds itself bandied about all too easily these days, there are occasionally those whose merits deserve such an accolade. One name which springs to mind in recent years would be Graham Coxon, guitarist, songwriter and founder member of Blur, one of the most successful British groups of modern times. Having released six albums and a string of hit singles including two number ones, his sudden departure from the band in 2002 prior to the release of their seventh and as-of-yet final long player sent shockwaves through the rock and roll community. However, with a solo catalogue that was growing by the minute, Coxon's endeavours became channeled elsewhere culminating in Happiness In Magazines and Love Travels At Illegal Speeds, his most successful commercial ventures away from the band to date. His seventh and most recent collection of songs, 2009's The Spinning Top, marked another musical departure, the record taking the format of a folk-driven concept album documenting the life of a fictional character from life until death. Despite rumours circulating since Coxon's re-appearance with Blur at Glastonbury two years ago that the band would be ready to record again, little has emerged since 2010's 'Fool's Day' single for Record Store Day last April. Coxon however has been busy in his own right, recently issuing a new song 'Desire' featuring Paloma Faith and former Coral guitarist Bill Ryder-Jones for a Converse television advertisement. DiS: How does it feel playing a small venue like the Proud Gallery this evening after playing so many bigger venues and stages throughout your career? Graham Coxon: This whole venue is about as big as the entire stage Blur were playing on at Glastonbury a couple of years back. This is one of my favourite venues though. I mean, it could do with a few more inches on the stage so I can fit all the band on there - we have six people playing tonight - but overall this is the best. I prefer smaller, louder, sweatier gigs. DiS: Do you see it as a sort of reinvention of Graham Coxon as a solo artist by playing smaller venues like this? Graham Coxon: Hmmm...I'm not sure if I'd call it a reinvention. The thing is, whoever I've played with, we've always played pokey little toilets at various points as well as the bigger places, so for that reason I tend not to read too much into it. I remember going out on tour with the Kaiser Chiefs when their first album came out, and we were playing these huge venues, and then straight after I did my own shows at places like the Buffalo Bar, and people were coming up to me saying they'd seen me on the Kaisers tour and surely it should have been the other way round with them supporting me? Which of course it shouldn't because they were selling out venues much bigger than the ones I was playing in at the time! DiS: You spent time in the East Midlands when you were younger? Graham Coxon: Yeah, I guess you could say I'm from up that area. I'm from Spondon near Derby, do you know it? Graham Coxon: Oh, that's excellent, because when I tell people from round here that I'm a Derby County fan they just shrug their shoulders and go "Oh, OK" before changing the subject. It's almost like I don't count! DiS: What do you think about Nigel Clough's managerial skills? DiS: You've recently made a new song available, 'Desire', which features Paloma Faith and Bill Ryder-Jones. Would you say that's a good indication of what the new album will sound like? Graham Coxon: It's not really a good indication, as that was purely a one off about me choosing someone to work with and I'm a massive fan of Paloma. I already had this demo of a song floating around with several patches missing, and that's where she came in and wrote lyrics to the verses and created her own imagery, which I really liked. She actually sang a lot of garagey stuff early on in her career, and I actually like the idea of girls singing my songs, especially ones that are quite relaxed enough to improvise a bit. DiS: So does this mean you have a wishlist of girls you'd like to sing on your records in the future? Graham Coxon: Rihanna's great isn't she? She's great because she's completely...unshit. She smiles and looks positive and seems really happy and...not that it will ever happen! There's all sorts of people I'd love to work with should the opportunity arise. DiS: You've got the new record coming out at the back end of the year. I guess you must be quite excited about it? Graham Coxon: Very. I recorded it with Ben Hillier. It started with a lot of rough demos and ideas which I had, some more finished than others, and I just decided to do it. By the end I had about twenty-five songs to work on. They weren't all finished. Some were just a riff or a chorus here and there, but then at the back end of last year we went into the studio and started working on them properly. DiS: How did you whittle it down to an album's worth of material and what happens to the songs that don't make the final cut? Will any of them resurface in the future? Graham Coxon: I always have this thing when I have a bunch of songs where they start to go into two piles. The next album is one pile and then those on the second pile are the ones that I'm not quite sure about at this stage. The next album has more experimentation with drum machines on it. I still recorded the guitar parts live but to a backing track of old synths and drum machines, but we sort of let it have a life of its own after that. The other stuff that didn't make the album is more song-y, sort of old fashioned indie I suppose I'd call it. I don't know if anyone else still uses that term or expression? There's cute bits, maybe a Velvet Underground kind of feel in there as well...but they're staying in the second pile of songs for now. DiS: Have you got a projected release date for the album? Graham Coxon: Not really, no. I just thought it would be a good idea to get some of the ideas I had turned into songs and then take it from there. DiS: Do you see it as a considerable departure musically from where you left off with The Spinning Top? DiS: Electro Mod? What's that? Graham Coxon: Well that's what the kids looked like to me. They looked like they were dressed as Mods but they were like....electric Mods...and they were dancing to a lot of synthesized music with guitars and drum machines, and the sound in the Cockpit was all loud and echoey and it kind of struck me that it's something I'd like to do, so I've almost based the entire new album on that moment! DiS: What other music are you listening to at this moment in time? Graham Coxon: There's so much good music around at the minute it would be difficult to pinpoint any particular one. DiS: I recall you doing some artwork for Kate Rusby and regularly praising the work of people like Martin and Eliza Carthy. Are you still heavily influenced by the underground folk scene? Graham Coxon: I still keep in contact with all of those people, yeah. The thing is, it's Martin Carthy's job to interpret English songs I suppose, whereas he actually likes a lot of old punk stuff, believe it or not. DiS: You collaborated with several artists on your last album. Who's in your band this time around? Graham Coxon: It's basically me and the same guys who've been playing together for most of my solo career to be honest. I guess you could even say we actually formed our own group in 2000 when The Golden D came out. With The Spinning Top I recorded that mainly with jazz musicians. Graham Fox, Dan Thompson, people like that, and they were also involved when it came to playing it live, but apart from that, it's been pretty much the same group of people involved throughout my solo career. DiS: It must be difficult putting a live set together with so much material in your back catalogue to choose from? 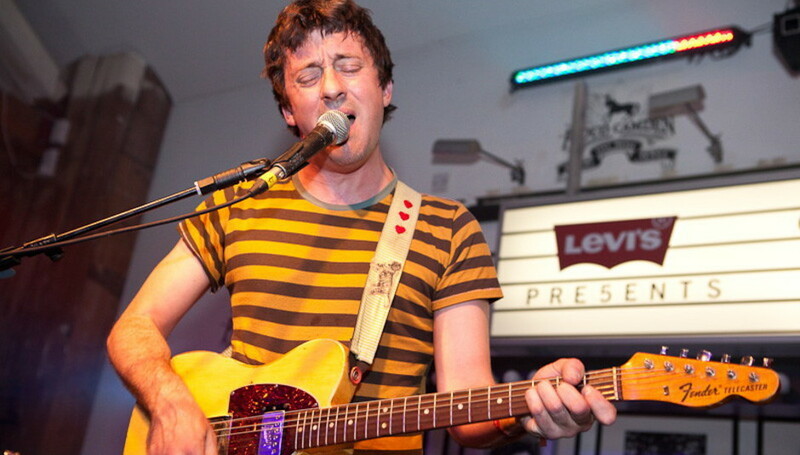 Graham Coxon: We just tend to put the songs in which we enjoy playing the most really. There are always ones which I might like and some of the other band members don't, and vice versa as well, and I also think you've got to test the audience too. Tonight's set is about 50% worth of new stuff. DiS: Are there any songs or periods from your career which you don't normally revisit for various reasons? Graham Coxon: Not really, although The Golden D we don't tend to bother with as much. It was so angry that record. In a way I actually feel quite awful singing it now. DiS: Would you be able to look back through your archives and pick out any one album or song as being definitive of Graham Coxon? Graham Coxon: Yeah, The Kiss Of Morning is nice. This new one might raise a few eyebrows as well actually. I've been accused of playing it safe a bit and being majorly influenced by post-punk and very little else, which isn't the case to be honest. Graham Coxon: Well yeah. I can't help it. I mean, I'm not going to play music that I hate. There's no point in touring with a band if you're playing music that you hate...I just get influenced by stuff that I listen to, although I do appreciate lots and lots of different types of music. Jazz, indie stuff, punk stuff, electric folk, psychedelic stuff...there's so much out there. DiS: You've been a vocal supporter of Record Store Day since it first came into being. Do you think events of this nature are paramount towards ensuring the survival of bands and independent record labels? Graham Coxon: When you download something it's almost like eating a bar of chocolate and then chucking away the wrapper when you've finished. It just isn't the same as having a physical copy of the record. I've nothing against it. I mean, I download music for convenience sake but I'd much rather have the real thing. It is very easy if you want to just listen to something first. DiS: It's almost like an acceptable way of dismissing music as a disposable commodity. Graham Coxon: We'd say that, but sadly most people who listen to music wouldn't. They'd just see it as a way of being able to consume the same amount of music by spending less money. They have other priorities, we love music and that's the problem. It's very important for people to keep the vinyl market alive, and I'm playing LPs much more than CDs now. I think the fact it has two sides still adds to the excitement for me. If I listen to a record like All Mod Cons by The Jam for example and 'To Be Someone' comes on, I know immediately it's the second track on side one. I don't go in for all this shuffling of tracks nonsense. DiS: So, apart from your solo record, are there any other plans in the pipeline this year? DiS: I have to ask what your opinion of my club and your biggest rivals Nottingham Forest is? Graham Coxon: I don't really have an opinion about them! I never really talk that much about football in London anyway. I try and steer clear of football conversations having been accused of being a Chelsea fan for the best part of twenty years! People used to think we all were...you know, "If Damon is then you all must be".